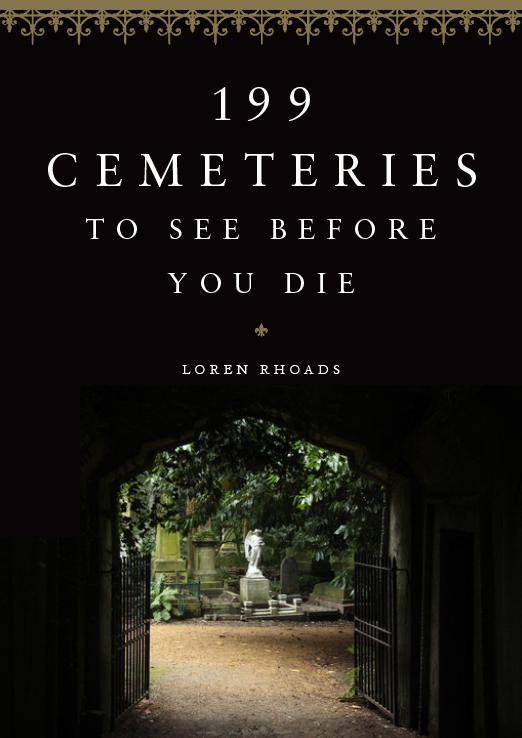 Considering I didn’t have a new book out in 2018, I was pleased with the attention that 199 Cemeteries to See Before You Die continued to draw. It opened doors for me to speak at a bunch of new (to me) venues last year, too. Hopefully, I persuaded some new people to check out the beauty of these fragile historic places. I put a collection of my cemetery essays up on Wattpad in July and August. Graveyard Field Trips: A Memoir gathers essays I published on Gothic.Net and GothicBeauty.com, along with the introduction to the original edition of Death’s Garden: Relationships with Cemeteries. At the moment, I have a proposal out for my new book, The Pioneer Cemeteries of the San Francisco Bay Area, and another proposal for a nonfiction book with Lisa Morton, president of the Horror Writers Association, that I’m excited about. Hopefully those books will find homes in 2019. I’m not sure what cemetery project I’ll work on after those are done. Maybe I’ll finally finish the second volume of Death’s Garden. “Four Graves for Harvey Milk” appeared on The Cemetery Club to kick off Great Britain’s Gay Pride Month. “10 American Cemeteries to See Before You Die” appeared on The Daily Beast in April 2018. My collection of cemeteries to see in springtime was illustrated with images from 199 Cemeteries. I wrote 9 cemetery columns for the Horror Writers Association’s newsletter about the histories of burial and cremation, cemetery ghost stories, and gravestone iconography. “The Madam’s Haunted Tomb” served as part of the Ghosts in the Graveyard series on Roxanne Rhoads’s All Things Halloween blog. I talked about a ghost legend centered on New Orleans’ Metairie Cemetery. Here on CemeteryTravel.com, I was proud to put together a two-part series on the “Resting Places of Horror Icons.” Here’s part one. I spoke to Angela Hennessy’s “Over My Dead Body” class at the California College of the Arts in February. My lecture, called “Memento Mori: Even Graveyards Die,” covered the demolition of the historic cemeteries of San Francisco. In April, for the “Memento Mori” evening of the Reimagine End of Life week, I talked about the dismantling of “Laurel Hill Cemetery: San Francisco’s Garden Cemetery” at the Swedish American Hall. 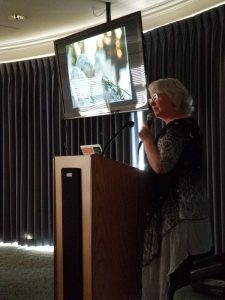 I talked about how I came to write 199 Cemeteries to See Before You Die at the Association for Gravestone Studies conference in Danbury, Connecticut in June. In September, I showed slides of my favorite cemeteries from 199 Cemeteries to See Before You Die at Cypress Lawn Memorial Park in Colma, California. Professor Steven Brown invited me to talk about cemeteries to his horticultural class as San Francisco’s City College on October 1, 2018. And I talked with Timothy Renner about cemeteries for his Strange Familiars podcast, but it hasn’t been released yet. 199 Cemeteries to See Before You Die continued to get some press attention this year, even though the book’s been out more than a year. Most of these stories were nice surprises when I stumbled across them online. A catch-all category for things that made me smile this year. 199 Cemeteries made the preliminary ballot for the Horror Writers Association’s Bram Stoker Award in Nonfiction. While the book didn’t advance to the final ballot, it was still an honor to make the long list. The podcast Two Girls One Ghost read my fan letter on air after they mentioned 199 Cemeteries in an earlier episode. Here’s a link to their Haunted Cemeteries podcast: https://audioboom.com/posts/6692482-episode-27-rest-in-peace which originally aired on 2/25/18. 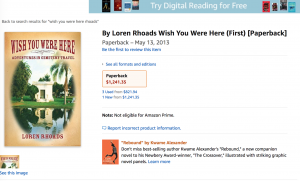 I came across the first edition of Wish You Were Here: Adventures in Cemetery Travel listed on Amazon for $1200. I’d gladly set you up with one for 10 bucks. Finally, I got to provide a cover blurb for the first time. I am really excited about Erin-Marie Legacey’s Making Space for the Dead, which is coming from Cornell University Press in April 2019. You can preorder it on Amazon: https://amzn.to/2RkuyiT. 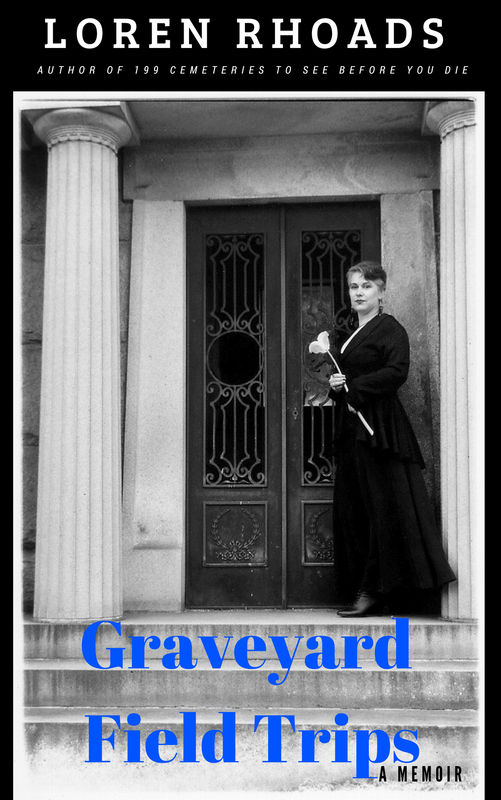 This entry was posted in 199 Cemeteries To See Before You Die, Good cemetery news and tagged 199 Cemeteries To See Before You Die, cemetery books, cemetery lecture, cemetery podcast, ghost stories, Graveyard Field Trips. Bookmark the permalink. A beautiful place filled w early settlers,founders of this nation and US president. Thanks, Beth! Unfortunately, with only 100 cemeteries in the US, I had to make some hard choices to jam everything into 199 Cemeteries. It would be easy to come up with 100 cemeteries to see in New York alone! Thank you for adding another one to my list.